During the 1930’s and 1940’s, residents of the Golden Gate barrio began holding Mass in their homes, an old store and in a vacant lot with benches. Father Albert Braun, O.F.M., a hero who served as a chaplain during both world wars, came to the area in the 1940’s and Sacred Heart Catholic Church was established as a mission. Under Fr. Braun's care the community joined together to build the beautiful brick church that still stands near Buckeye Road and 16th Street. This church was dedicated on October 14th, 1956. 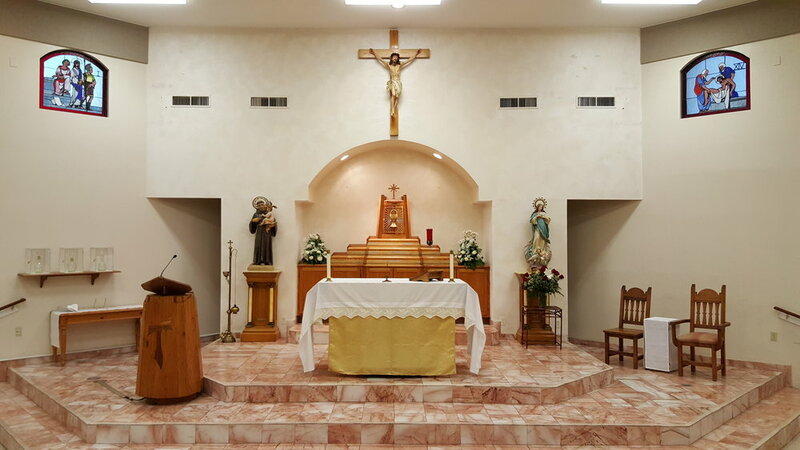 However, amidst the expansion of Sky Harbor Airport in the 1970’s, the community was severely impacted and Sacred Heart was forced to leave the original brick church. In the mid 1980's the new church was built in its current location at 12th Street south of Buckeye Road. Here the community was served faithfully by the Franciscan Friars including Fr. Luis Baldonado O.F.M. from the early 2000’s until 2014. Since 2014 the parish has been lovingly guided by the current pastor, Fr. Paul Sullivan. Also, the Vocations Director for the Diocese of Phoenix, Fr. Sullivan approached New Jerusalem Studios in 2016 with the ambitious vision of organizing the parish around the beautiful and reverent celebration of the Sacred Liturgy and a plan for complete renovation of the interior of the church. 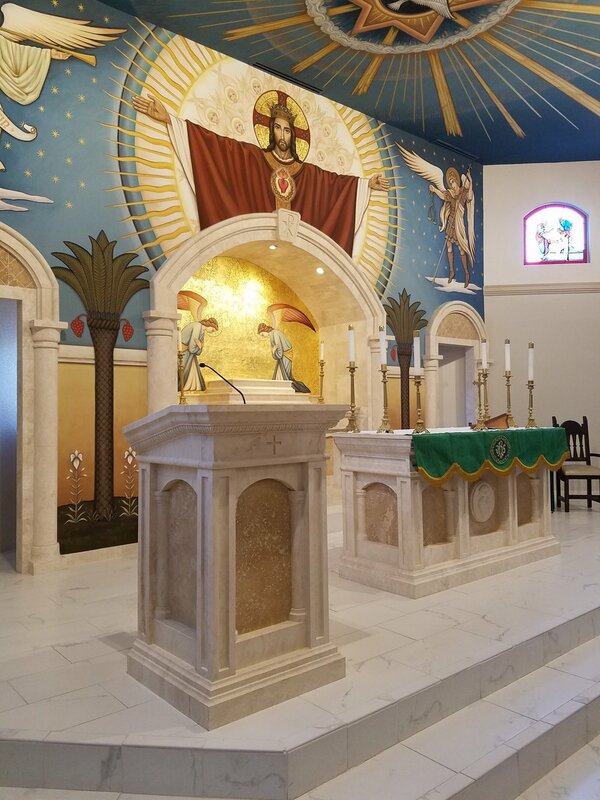 The renovation included new tile in the sanctuary and nave, redesigned stone altar, ambo, and altar of repose as well as stone architectural elements, coffered ceiling and lighting design, refinished pews, and mural work. 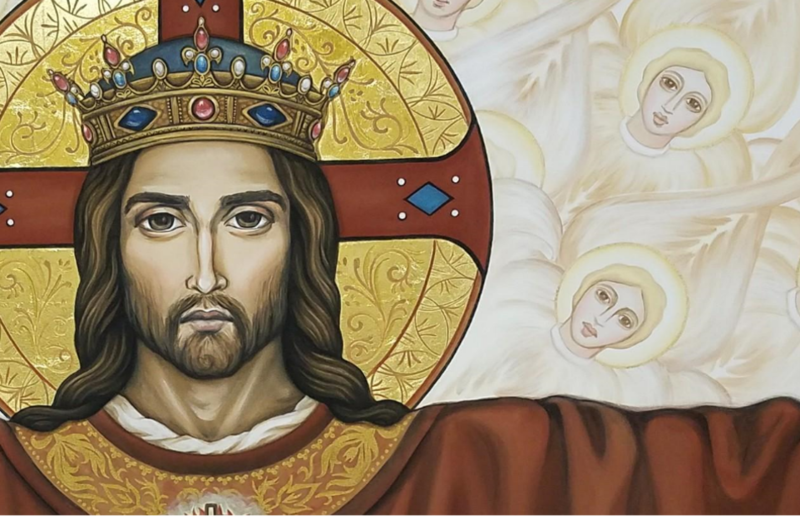 The mural work is anchored by the prominent central figure of the Sacred Heart of Jesus presented as True High Priest and King of the Universe, surrounded by the 6 winged Seraphim in a 9-fold presentation, and flanked on left and right by the Archangels Gabriel and Michael. The Christ figure is placed at the center of a large circle representing the locus of Divine Life radiating as spears of golden light. The image also features depictions of the restored cosmos and Garden of Eden, represented by geometrically pattered stars and stylized local flora. 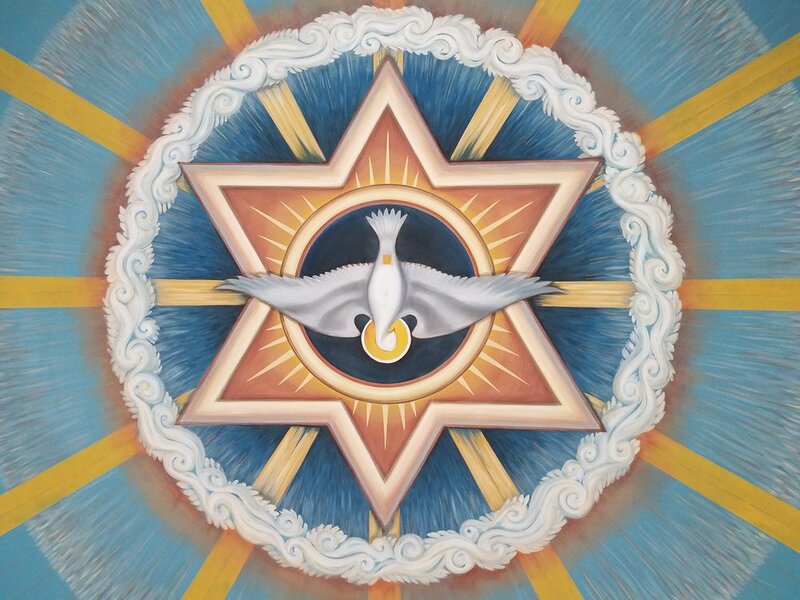 Above the altar, complementing the central figure of Christ, and completing the Trinitarian representation, is the burst of light and cloud, representing God the Father and a sacramental image of the Holy Spirit descending as a dove. Radiating from the center of all the images is the light and energy source of the entire work. The tabernacle niche features a pure gold leaf field enveloping two adoring angels, positioned as the fulfillment of the Cherubim of the Old Covenant, protecting God's presence in the Arc of the Covenant. Here, the angels protect and watch over the new place of God's presence in the Eucharistic Tabernacle. The etched floral pattern on the gold leaf field, gives an obvious clue to the thematic foundation of the mural work; the pattern evokes the miraculous floral image which is a part of the Tilma of Juan Diego. The color palette for the mural work and several thematic elements are drawn from the image of Our Lady of Guadalupe, a beloved devotion in the parish of Sacred Heart. Continued renovation plans include a stand-alone depiction of St. Joseph the Worker as complement to the image of Our Lady of Guadalupe, decorative painted design for moldings and ceiling, and two other smaller pieces with projected completion date of Spring 2018.